Many people view food as “good” and “bad” which naturally flows onto seeing themselves as “good” and “bad”. This black-and-white thinking leads us to make choices we may not naturally make – ones that are aren’t guided by our own intuition or internal body cues. When this happens, we find it hard to meet our basic needs causing us to become distracted. Our self-care then suffers. Do you worry about what you should and shouldn’t be eating? Do you ever feel guilt or shame after eating some food? Do you find yourself thinking and/or talking about food most of the time? Do you avoid certain foods or food groups with no medical reason (i.e. allergy/intolerance)? Do you think of food or yourself in terms of ‘good’ and ‘bad’ depending on what you have eaten? Do you make food choices based on the label (e.g. calories, fat, sugar etc)? Do you avoid buying or restrict some foods because you feel you cannot trust yourself to stop eating the whole packet/portion? Do you avoid social situations because you feel anxious or worried about food or eating? Do you base your food choices on your weight; e.g. if you’ve gained weight, do you eat less or follow a diet more strictly? Do you ever compensate for what you ate by exercising more, particularly if you ate a certain food or think you ate more than you should have? Do you eat and stop eating when you think you should rather than what your body feels like? Do you turn to food when you feel sad, lonely, angry and so on? Can you leave some cookies on the plate because you know you can have it again tomorrow? Would you feel comfortable if your 5-year-old child were following this eating pattern? 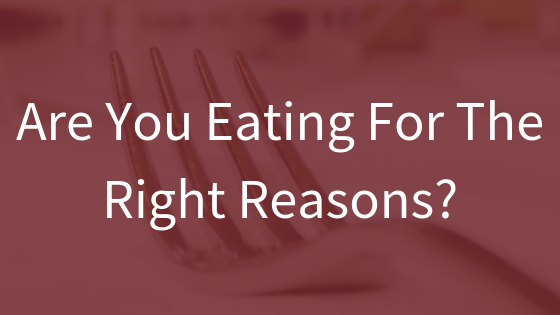 If you answer yes to these questions, you are eating for the ‘right’ reasons. Am I eating because I respect my body? Am I eating this food to nourish me rather than to change my body weight, shape or size? Am I eating this food because I actually want this food? Am I eating this food because it will make me feel good? “Normal eating is going to the table hungry and eating until you are satisfied. It is being able to choose food you like and eat it and truly get enough of it -not just stop eating because you think you should. Normal eating is being able to give some thought to your food selection so you get nutritious food, but not being so wary and restrictive that you miss out on enjoyable food. Normal eating is giving yourself permission to eat sometimes because you are happy, sad or bored, or just because it feels good. Normal eating is mostly three meals a day, or four or five, or it can be choosing to munch along the way. It is leaving some cookies on the plate because you know you can have some again tomorrow, or it is eating more now because they taste so wonderful. Normal eating is overeating at times, feeling stuffed and uncomfortable. And it can be undereating at times and wishing you had more. Normal eating is trusting your body to make up for your mistakes in eating. Normal eating takes up some of your time and attention, but keeps its place as only one important area of your life. Are you eating for the ‘right’ reasons? If not, what ONE thing will you focus on to move you closer to eating for the ‘right’ reasons? For support, contact me, or if DIY is more your style, grab a copy of ‘30 Days to a Better Relationship With Food and Body’ ebook. This article appeared first on The Womens’ Wellness Journey. Hi! I’m Natalie Thompson, a non-dieting Accredited Practising Dietitian based in Cairns, Australia. Are you ready to improve your nutrition and stop the struggle with food and your body? Welcome to the Non-Diet/Health At Every Size(R) space. Here you will learn how to reconnect with your body and find joy in eating and make peace with food and your body. Your body is not your problem. Society’s expectations and ideals of health are being made your problem. I look forward to a time where health is not the reason for ill health or the solution for improving health. Health professionals who focus on your weight are not helping you. Please find someone who understands weight science and big picture of health. Vanilla Birthday Cake Recipe - Egg and Dairy Free!